We've recently seen a few games pop up on the Switch eShop from Nordic publisher 10tons. 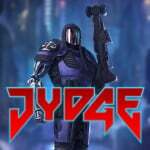 Next week, on 19th October, we'll be treated to JYDGE; it's a top-down shooter where you get to build your own cybernetic JYDGE and eradicate crime in the never-sleeping megacity of Edenbyrg. It seems good in principle, so here's hoping the gameplay stacks up. Do you plan to check this out next week when it arrives on the Switch eShop? I thought that read as Judge Dredd at first glance. Will it use twin stick controls? Spotted this yesterday on the Eshop. Definitely interested. Love how games like this just appear on the coming soon section and release a few weeks, or sometimes even days later. Well on the UK Eshop they do, the US Eshop staff need to pull their fingers out of wherever they are and update it much more often. On Wii U we'd be hearing of a game like this months in advance of it's release.On Switch it's just another day, another quality indie game announced. Picking this up for sure. This reminds of that one Capcom Sega Dreamcast game (Cannon Spike) that no one likes, hopefully it plays better. @OorWullie I love it too. I find myself checking the coming soon section several times a day just to see if anything new has popped up. I noticed on Steam forums a dev calling this the "sister game" to Neon Chrome. Same universe, same devs, but this time the levels aren't procedurally generated. Looked nice until i saw it is the same as neon chrome which i got from ps plus and didn't like. Will wait for a review. Hopefully it will be better as i love this genre. ...hmmm the trailer music really seems out of place...maybe if I'm bored I will pick this up but don't count on it. Was hoping for something different there but got some homage/rip-off I dunno... the reviews sound meh on YouTube. Man, this article is littered with spelling mistakes. Yoyrself, rythless, pyblisher, yp, eqyipment the list goes on! @OorWullie At this point the Switch is getting the equivalent of one nearly one new game every single day. It's insane. Lyks ynterstyng. I myght pyck thys up yf the revyews are satysfactori. Can't read this for one second without suddenly screaming "I AM THE LAWL!!!!" Dredd was such an awesome movie. I hope it gets a TV series on Netflix and a proper AAA game. I'd much rather see a developer make a true Judge Dredd game. I find it irritating that some lazy developer tries to piggyback on a storied franchise by using creative spelling to ALLUDE to Dredd but doesn't bother to get the license. Some say imitation is the sincerest form of flattery, but I just think it's unethical crap. Oh, and the generic neon artwork and simplistic 3D models are amateur hour. @AirElephant Ey don't cut yoursef on that edge you got! I've seen some gameplay before this trailer and it's mostly objective based gameplay it's a bit like Crusader games from EA with a bit of Judge dredd and Blade runner mixed in. Polished overall presentation, don't own a switch (yet?) but it looked like a fun little bargain bin title. @abrader I love it too, I don't get why most people shun on it. I know it has Charlie and Cammy with guns but it's still a fun action game. Its from same developers as neon chrome. In most Scandinavian/Nordic countries, the 'y' is pronounced as a 'u' when used as a vowel, so it's perfectly natural for them. @AirElephant It more than likely has nothing to do with creative spelling or "alluding to Dredd but not bothering to get the license", as I have explained in the comment above this one. @retro_player_22 I'll join in with the Cannon Spike love. Very enjoyable game, far as I am concerned. Really had that arcade feel too. @ThanosReXXX : from ridiculous to clever. Thanks for the information. @ThanosReXXX Eh, the devs are in Finland and Finnish is one language where 'u' isn't pronounced halfway to 'ü'. My first reaction would've been about this somehow deriding Swedes... but 10tons is, however, located in Tampere and I've given up on trying to understand their humor (see Star Wreck). @Pahvi Aha... Well, I stand corrected, then. So, would the suspected "derision" towards the Swedes be the on purpose non-Finnish (and decidedly Swedish (or Danish)) pronunciation? @ThanosReXXX I'm more inclined to think the name is just a joke. @Pahvi In this case, I would think so too, but more towards non-Nordic people than towards the Swedes. As you can see in the earlier comments in this section, people were already misinterpreting the text and its pronunciation and the possible reasons behind it. So, it'll probably be an inside joke meant for their own amusement. @SLIGEACH_EIRE ? Welll thats obviously the angle they were going with. @YANDMAN Yep, obviously. They'll disband after this game and form a new company called "Clyff" for their next game "Hanger". @SLIGEACH_EIRE Pointless attempting sarcasm if you're no good at it.